Successfully Added Android Smartphone Uhans H5000 - Android 6.0, 4G, Dual-IMEI, Quad-Core CPU, 3GB RAM, 4500mAh, 5 Inch IPS Display, 720P (Black) to your Shopping Cart. 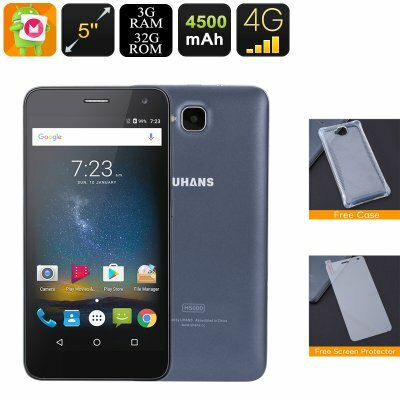 If you are looking for an affordable Android phone that brings along great connectivity, the Uhans H5000 is the perfect smartphone for you. This cheap Android smartphone features Dual-SIM card slots and supports two IMEI numbers thanks to which it allows you to be reachable on two phone numbers at the same time. Additionally, it comes with 4G connectivity that brings along the fastest mobile data speeds out there. No matter where you’ll be at, from now on you’ll always be able to browse the web at lightning speeds and stay connected to friends and family online. Running on the Android 6.0 OS, this mobile phone comes packed with the latest features and software alike. No matter for what purpose you’ll be using this cheap Android phone, it is guaranteed to meet all your demands and treat you with an exceptionally smooth user experience. Besides its state of the art software, this Android smartphone also comes packed with sophisticated hardware that brings forth a powerful performance. With a Quad-Core CPU and 3GB of RAM in place, the Uhans H5000 will handle games, movies, and applications without dropping a frame. On its beautiful 5 Inch HD display, this Android smartphone portraits stunning visuals to let you fully enjoy your favorite media on the go. Thanks to its IPS technology, it brings forth a high range of colors and high detail that will further increase your overall entertainment experience. Featuring 32GB of internal storage and an SD card slot that supports up to 64GB, this Android mobile phone packs plenty of space for you to store your latest downloads. Simply head out to the play store and download games, movies, and applications – with this Android phone at hand, you’ll never have to feel bored again. Packed within its body, this Chinese smartphone holds an epic 4500mAh battery that brings along 5 hours of continuous usage time. With all this power you’ll be able to get trough the most demanding of smartphone days without needing to recharge your Android device. Additionally, it comes with a top-end 8MP rear camera and 5MP front camera for you to snap pictures and videos of all your upcoming holidays and adventures.